Have you been searching for an easy-to-follow, low prep, highly engaging, research-based project for teaching the stock market? If so, this project is for you! Watching my students research stocks, get a little competitive with their peers, and become really invested in the success of their companies is one of the highlights of my semester. 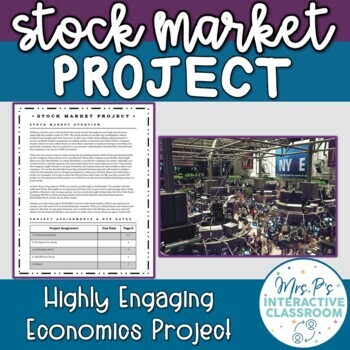 I created this project with the intent that students could use the provided materials to not only gain a baseline understanding of the stock market but comprehend relevant vocabulary and put what they’ve learned into practice as they “purchase” (and later “sell”) their own stocks. I usually complete this project with my students in 1 block period and 1 50-minute period spaced a month apart (so their stock prices have time to change). I’ve included Teacher Advice for Implementation & Grading as well. 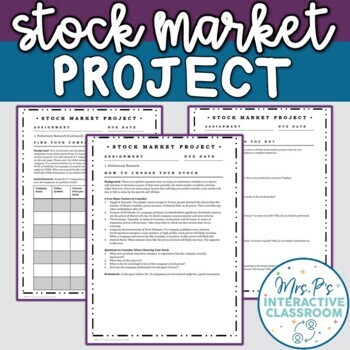 Stock Market Student Copy PDF: If you do not wish to make any changes to the project, you can simply use this version and print off enough packets for all your students. Stock Market Student Copy Editable: Allows you to edit the project using PowerPoint if you wish to make modifications.